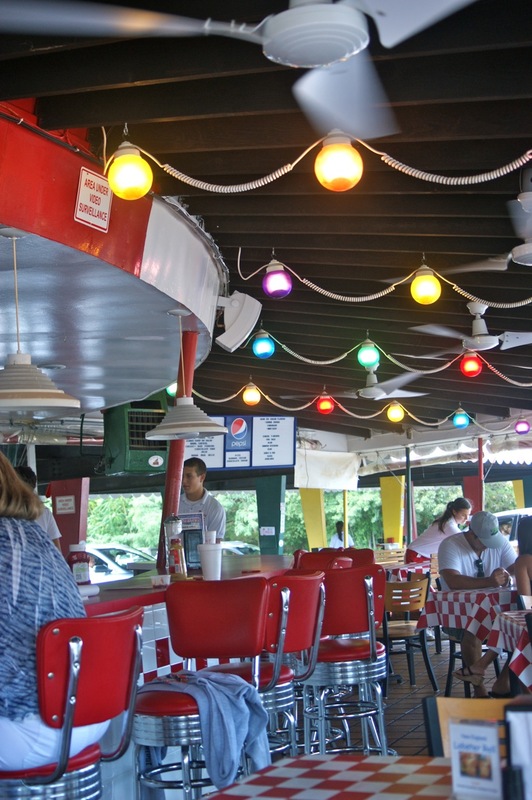 It's a slice of Americana on the side of the highway, one that's promised family fun since 1954. Even before ordering lunch, Ron and I are checking out what to have for dessert. Veli opted for a creamy concoction dropped on a fudge brownie called a Circus Car. 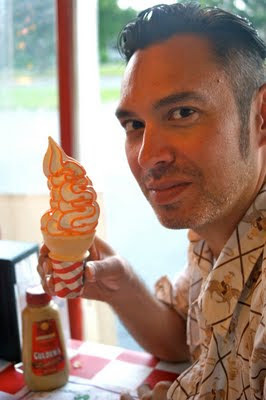 And Ron chose a vanilla cone swirled in orange creamsicle. I, on the other hand, happily settled for a Bear Hug. The Find: Trimmed for Fun! When I was a kid, we used to love rummaging around in my mom's sewing kit, much to her displeasure, I'm sure. We would unroll the ric-rac, sort her buttons and and stretch out strands of elastic, most certainly leaving a mess when we were through. That's why I was so attracted to this gleeful display in the apartment of Chris Bick and Keith Carollo, the masterminds behind the online shop Fred Flare, while I was scouting locations for The Find: The Housing Works Book of Decorating With Thrift Shop Treasures, Flea Market Objects, and Vintage Details. Perched on a duo of Urban Outfitter wall sconces is a set of dancing girls all made out of sewing notions, pipe cleaners, shimmery fringe and pastel doodads, created by their pals at Patch NYC. The juxtaposition of the somewhat formal white fixtures with the frivolity of these dancing glamor gals exudes wit and whimsy. Displayed on a bright blue wall, this cacophonous assemblage is a perfect example of isolating a collection in one place, where scattering throughout a room might only make the space feel cluttered. The Object of My Desire: Prepared! 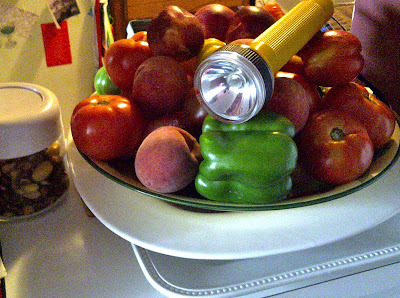 We were absolutely ready for the worst, but I didn't even have to touch my Hurricane Irene preparedness display! Well, if I must admit, I did eat a peach. Thankfully, the only effect we felt from Irene's arrival was a leaky window, which was easily remedied with an old bath towel. Goodbye Irene! 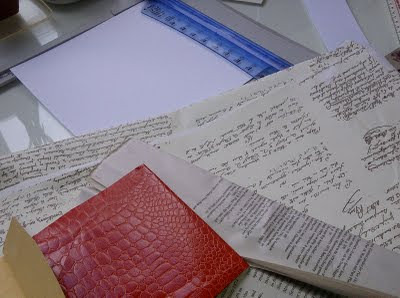 Reuse & Purpose: Why, Thank You! When it comes to wrapping gifts or sending out cards or letters, I always try to use what I have on hand. I enjoy the challenge more than running to the store and plunking down several dollars for a card that may not exactly convey the message I wish to express. When it came time back in May to send thank you notes for Veli's V-themed birthday celebration, I rummaged through my assorted pieces of paper and and looked to my jug of glitter for inspiration in sending sentiments in Veli's Croatian mother tongue. I found a font I liked, enlarged it and then made a stencil for my letters. 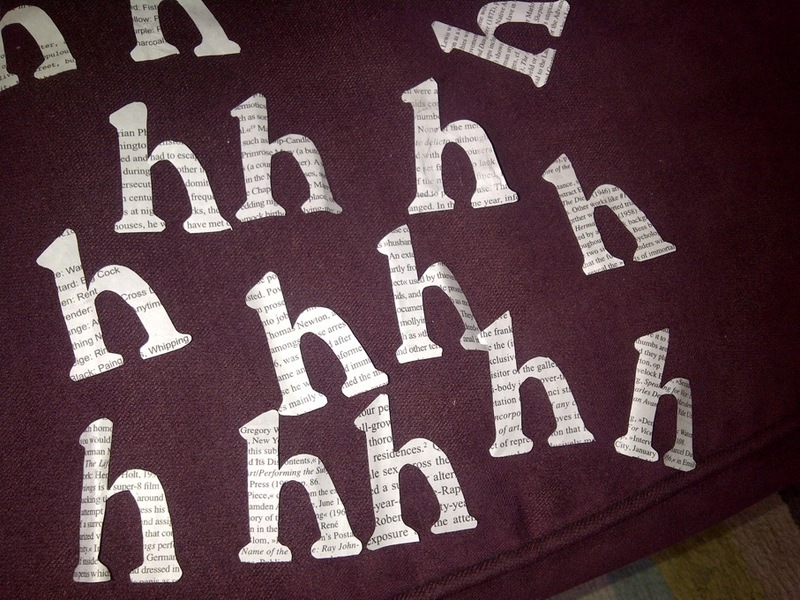 I cut out the letters "h" and "l" on a slightly naughty piece of newsprint I saved from a MoMA exhibit. For the letters "a," I repurposed gift wrap saved from Veli's birthday celebration. When we had to bid farewell to one of our dearest neighbors last week, I signed up to make a crudité platter for the goodbye party, since it seemed like everyone else was bringing all kinds of other sweet and savory goodies. I took inspiration from a vegetable satellite I made several years ago, which was basically all kinds of cut vegetables on toothpicks hovering around a cabbage planet. This time I placed the veggies closer together on the cabbage to create a floral effect, ornamenting the whole thing with strips of sweet yellow and red pepper. You may notice my 75-cent-plate from a yard sale that set a gorgeous green backdrop for my creation. Truly, this is one of the easiest dishes to make, and people are always amazed when I walk in the door holding it. "I could never do this," one guest told me, to which I replied, "Yes, you could. The hardest part is all the chopping!" 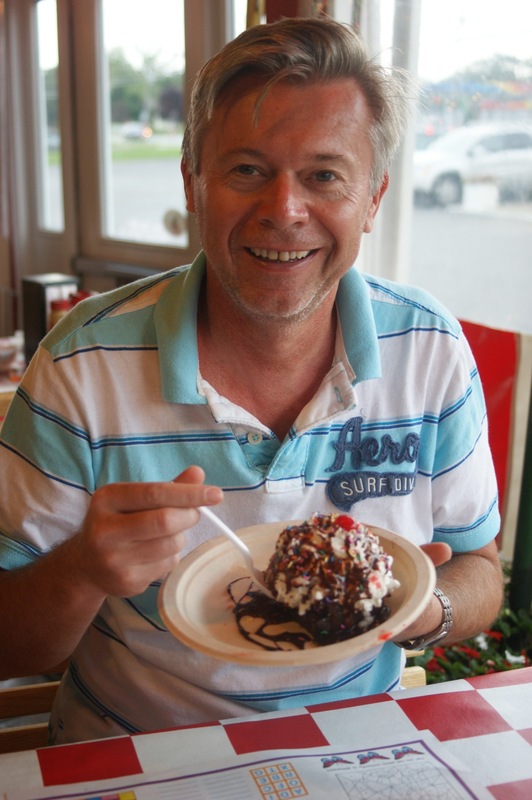 After spending yet another wonderful weekend on the Jersey Shore with Michael Quinn, I was reminded of this post I shared last year. While spending the weekend with the marvelous Michael Quinn on the Jersey Shore, we had an exuberant chat about the joys of decoupage, a craft that I have loved since I was a kid. When I was a Cub Scout, I remember taking a beach scene photo from a magazine, gluing it on a beaten-up square of stained wood, and covering it with layers upon layers of some type of adhesive that left it shiny and permanently sealed for many years to come. Then, my sister and I discovered Mod Podge, a white adhesive that we used to apply images that we had cut out from used greeting cards and affix them forever on a rock we had pulled from the creek near my Grandma Churchill's house. As we were leaving Michael's house in Point Pleasant, he pointed out a table he had made out of a large, wooden cable spool and had covered the top with a map of the Jersey Shore that he secured to the surface with Mod Podge. All that Mod Podge chat reminded me of one of my favorite images from The Find: The Housing Works Book of Decorating With Thrift Shop Treasures, Flea Market Objects, and Vintage Details. 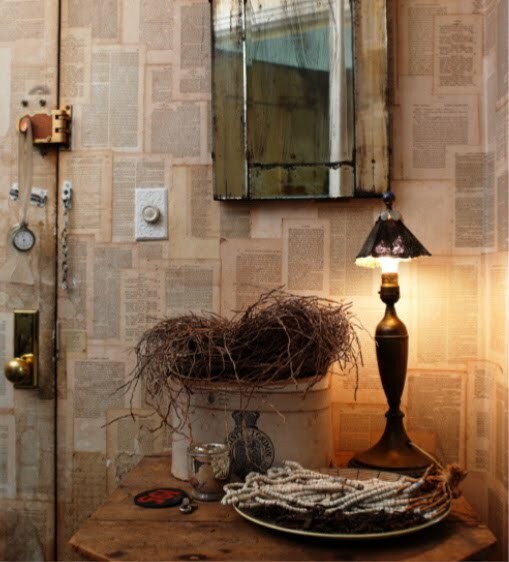 Photographed by Jim Franco, this image shows how pages from an old book were effectively used as wallpaper in the entry of decoupage artist John Derian's Lower East Side apartment. No, Derian didn't use Mod Podge on his wall of wonder. As I marveled over this dreamy creation, Derian told me that he used nothing more than watered down white glue to make this repurposed wallpaper and then smoothed it all out with a wet sponge. This cool summer day hints that autumn is on the way and that the long warm days I've been enjoying will soon turn over to winter's chill. 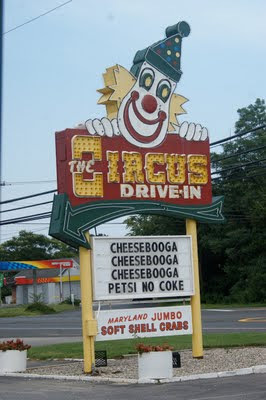 It also made me think of one of my old posts -- one that brings back the best of childhood memories. It's been several years since I've visited my Grandma Churchill's old home and dairy farm just outside of Mansfield, Mo., but it's about this time of summer that always look back at the lazy days of spending time with her and my sister there. For Grandma, it was anything but lazy, as she rose at 5:30, cooked a full breakfast complete with biscuits, gravy, eggs and bacon, and then headed out to the dairy barn to start milking the cows. While Grandma was at the barn, my sister and I would wash the dishes, listen to Captain & Tennille records on the phonograph and then head up the hill on a rocky path, pass the cob-webby cellar and climb over a barbed wire fence to visit her and my two uncles who helped her earn a meager living. The barnyard was full of cows and a bull, stray guinea fowl and white chickens. Cats milled around the milking room covered with white lime waiting for a squirt of warm milk that Grandma would aim in their direction, and get tickled at her own actions. Sometimes, we were allowed to drop grain from a coffee can into the troughs that distracted the cows as machines dangled and chugged. As soon as the milk was rendered and stored in a cooler for safe keeping, we would helpGrandma clean up the milking paraphernalia. We always got a kick out of washing the gigantic bottles used to feed the calves who were kept safely away from the rest of the herd. The barn is still there, but in a bit of disrepair. You can see the old troughs in the milking room, and the wooden slats that kept the cows in place during their twice-daily ritual. Around the side, near the feed room where all the cats had their kittens (and I'm sure where more than a few mice daringly called home), you can see through the broken glass the milk cooler in front of the old sink where we used to sing songs and tell stories with Grandma as we "helped" her get her work done. After days of romping in the creek that was called Flat Rocks, picking tomatoes in Grandmas rag-tag garden, playing with puppies and kittens all day long, and pretty much coming and going as we pleased, Mom and Dad would soon return to fetch us and take us back to Independence, where we would soon start yet another school year. I'm certain my mom and dad loved the break, and so did we. And the carefree days of being a city kid on a farm in the Ozarks linger to this day. The Gift of Thrift: Wrap it Up! When offering The Gift of Thrift, I always try to make sure that the packaging is as thoughtful as what's inside. So on my thrift shopping jaunts, along with a mental list of the people I know would enjoy a re-purposed treasure, I always have my periphery set for rolls of unique ribbon and unused greeting cards. A few weeks ago, I found these lovelies at the Film Biz Recycling thrift shop for $2. Now that's a wrap! I saw this display a while back in a shop that has since closed its doors. I was attracted to it because it puts a contemporary spin on an ordinary household object. Have you got a bunch of hot water bottles lying around that you just don't know what to do with? Maybe they just happen to be color coordinated and look pretty together but, blast it, you've just got too many of them? If you're the display folks at the Italian jean maker Energie , you just slice an opening in the side of the bottle, pour in a little water and group it together with all your others on a wall as hanging vases for assorted wildflowers! Here's another of my favorite posts from a while back on how to show off a treasured collection. Glass containers provide the perfect vessel to display almost any treasured collection. The trick is to gather similar objects -- either of shape, color, nomenclature or size -- and isolate them in the confines of a glass structure. Two of my favorite examples of glassed-in collections were photographed by Jim Franco for my book The Find: The Housing Works Book of Decorating With Thrift Shop Treasures, Flea Market Objects, and Vintage Details. 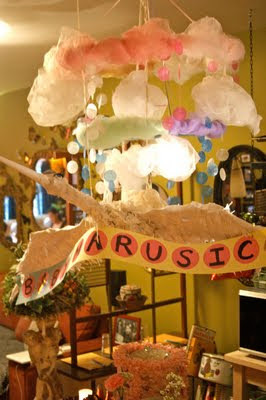 This whimsical example above was discovered on the Fire Island getaway of Saltaire. 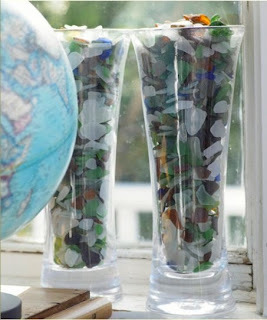 Tall beer glasses, easily found at thrift shops or discount stores, are filled with multi-colored sea glass where their hues and translucence capture the eye from their perch on a screened-in back porch. You could even use dissimilar shaped glasses to create a collection, provided they don't have distracting, inharmonious embellishments. 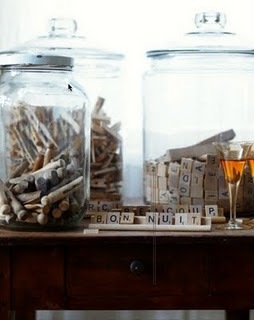 I also adore the way that Yasmine McGrane, owner and founder of Maison Rěve in Mill Valley, California, gathered clothespins and Scrabble tiles in apothecary jars for a thoughtful display. For further appeal, she separated the French wooden clothespins from the American variety. When I was visiting Yasmine at Maison Rěve in Mill Valley and celebrating the launch of The Find, I rummaged around in her workroom and snapped a photo of these wooden Lego blocks, grouped together and plopped inside what looks to me like an over sized pickle or mayonnaise jar. 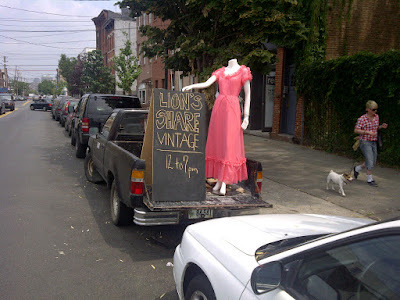 Last week, I told you about my visit to Karin Weiner's Lion's Share pop-up shop in Red Hook Brooklyn. Here's a little vignette that caught my eye for the way Karen used stitched parrots to set a background for a set of bird mugs. 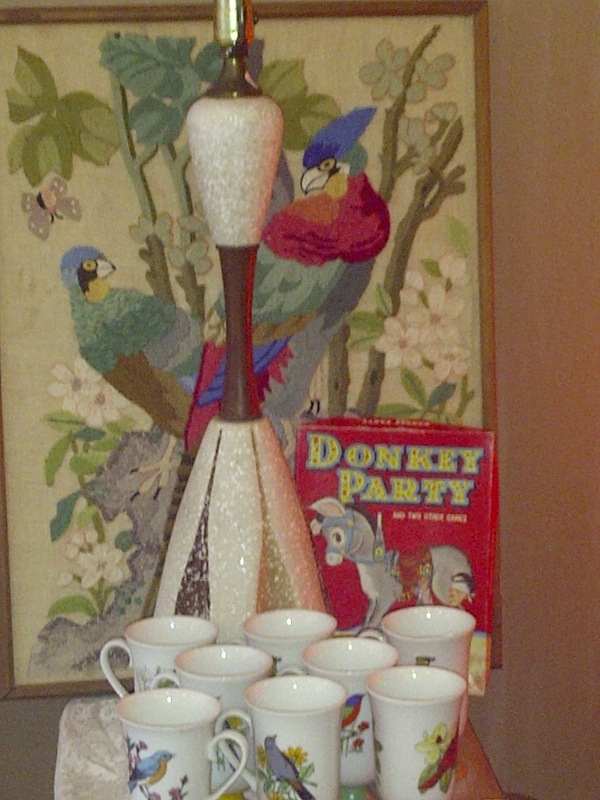 Unfortunately, you can't tell that this gathering is displayed on a vintage, wooden ironing board, but you can see the Donkey Party game that somehow -- at least to me -- just works in this setting. Go visit Karin for just few more Saturdays and Sundays on Van Brunt and King, from noon to 7 p.m. And tell her The Elegant Thrifter sent you! Don't throw out that old, mismatched yarn! If you're Karin Weiner, whose Lion's Share pop-up shop in Red Hook Brooklyn, lured me in with a mannequin in a pickup truck holding a sign promising all kinds of vintage treasures, you'll use these knitting staples to weave up a crafty look in lawn chairs. Karin said that rather than re-strapping with the typical materials, she and her boyfriend went to thrift stores, bought up all the old yarn they could find, and used it "re-weave" this sunny, summer must-have! Platters for 75 cents! I bought two of these three at a church yard sale on Long Island last weekend. Can you guess which ones? Since running this post a few years back, Mark Ciolli has left his teeny-tiny, Manhattan apartment for a large spread out on Long Island. His design business continues to grow, and here's one of my favorite images I shot while doing research for The Find. When hitting the thrift stores and the flea markets, my one word of advice when considering upholstered furniture is to seek items that you can buy and use in your home as-is. Certainly, there are a gazillion examples of fine furniture discoveries where the purchaser has graciously invested in a reupholstery job to fabulous effect. That is fantastic, and even better if you know how to do it yourself. But you're talking to The Elegant Thrifter, here. Like many of you, I have never attempted an upholstery job, but I do know it can cost a lot of money, especially if it's done right. design firm, Carl & Co., told me a story in The Find about how he purchased this elegant, tuxedo sofa at a Housing Works Thrift Shop. 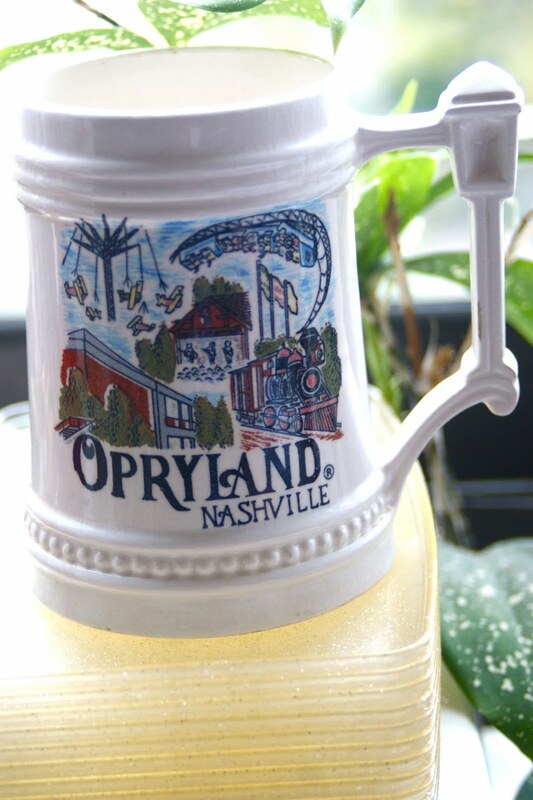 For family vacations, one of our favorite places to go was Opryland USA, a country-music-themed amusement park built around the Grand Ole Opry in Nashville, Tennessee. When I ran across this mug in a Methodist church thrift store on Long Island, I was taken back to the days of our loading up the Chevy Impala and hauling ourselves halfway across the country to spend a day or two in Opryland. Even though this mug was slightly more than I usually pay for these sorts of items -- $5 -- I had to have it for all the sweet scenes from the past it evokes. In the image on the left of this mug, you can see the Barnstormer, a ride that involved flying around in planes that turned and dropped from nosebleed heights. I rode this once and never again. But on the right is the Wabash Cannonball, an upside-down rollercoaster that I couldn't get enough of. I even dragged my poor dad on it once, after of course, he made certain his Dramamine was working. Unfortunately, this family destination no longer exists. It was leveled in 1997 to make room for an outlet mall, and the Wabash Cannonball sold for scrap metal. But this mug now sits on on a ledge on my window, reminding me of summers gone by and the memories they have left in their paths. It was at a SoHo loft sale recently that I found this Norman Rockwell book to offer my sister and her husband for their anniversary. This book, which was in its seventh printing in 1972, caught my attention because it reminded me of one we had as a kid, and it was $5. I wrapped it in some paper I happened to have on hand and tied it up in ribbon that I bought with my sister at an estate sale and shipped it off to Independence, Missouri, as a surprise "Gift of Thrift." I always go thrifting with an open mind and sometimes purchase items that I have no idea how I'll eventually use -- such as these vintage freezer boxes I picked up for a few cents at a flea market a while back. I bought them because of their cheery, retro designs, toted them home and stashed them away in a trunk that holds all my other vintage treasures awaiting their unique purpose. The right time for these boxes came a few years ago when I had a small gathering and wanted to offer a parting gift. I remembered those containers packed away with ribbons that came from the same flea market, filled them with assorted candies, tied them up in a bow and offered a sweet treat to my guests on their departure. Frugal Fun: Oh, Baby, Baby! When Heather Kerr, Ron Rangel and Michael Quinn set their sites on throwing a memorable gathering, the results are always original and truly magical. You might remember their handy work -- a vintage tailgate party -- from the pages of The Find: The Housing Works Book of Decorating With Thrift Shop Treasures, Flea Market Objects, and Vintage Details. Their most recent event -- a "Who's-Your-Daddy" -themed baby shower for their bestie Kristin Marusic's third arrival -- was full of festive flavor, from the papier mâché stork that hovered above a Crock-Pot surrounded in a fluffy pink cozy to the individualized invitations and twisted party games, everything was handmade with large amounts of love and plenty of help from their friends. When a high school friend showed me one of her thrift finds on Twitter yesterday, I was reminded of the magic that Turquoise Design's Vanessa DeVargas works with second-hand pieces. 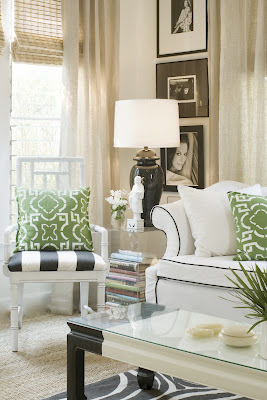 In this out-take from The Find: The Housing Works Book of Decorating With Thrift Shop Treasures, Flea Market Objects, and Vintage Details, photographer Bob Greenspan captures a classic black and white design scheme that's accented with juicy pops of green in the designer's Venice beach home. The Asian-style table found at a garage sale got a clever paint job that reflects the seat cushion across the room and the zebra-print rug on which it sits. When it comes to displaying her favorite vintage decorating books (many of which I own myself! ), DeVargas shows them off in a Lucite box designed with Jordan Cappella to double as a one-of-a-kind side table. While objects can often transport us to a memorable place in time, photos have the ability to bring back yesterday, clearly, crisply and in living color. My sister sent these photos take in the 1970s when I was probably in third grade and she in second. 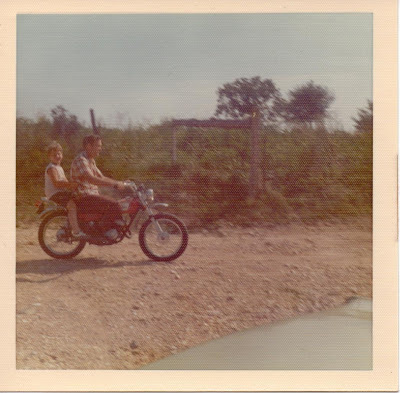 In the first photo, you can see me on the back of my uncle's motorcycle with my dad at the handlebars. Before you start to worry about our safety and wonder why we don't have on safety helmets, I can promise you we were moving at a snail's pace along the gravel road that leads to my grandmother's house in southern Missouri. 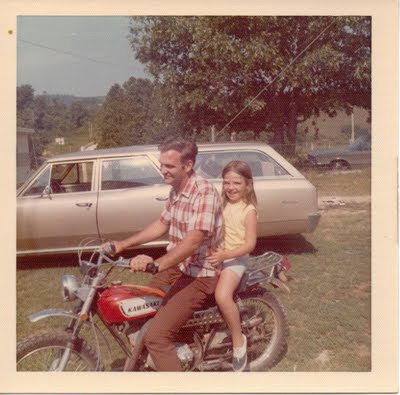 Here's my sister's turn on the Kawasaki. 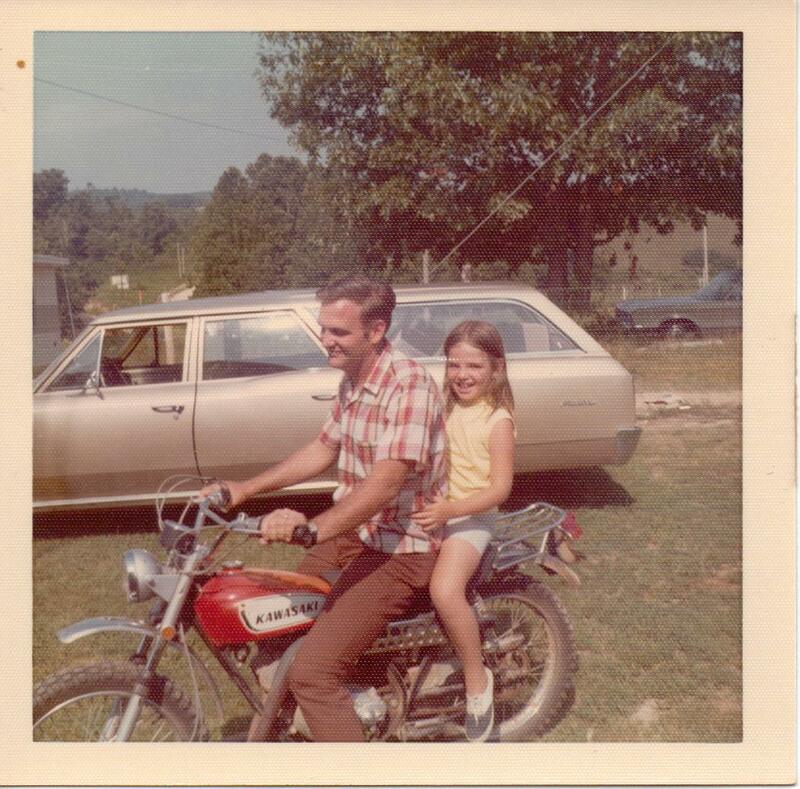 I remember that when she rode in the back, she wore the helmet, which I refused for fear of messing up my hair. (Don't have that problem today!) Also behind us is our old 1966 Chevy Chevelle Malibu station wagon. The main thing I recall about this car is that it did not have air conditioning, requiring us to take family trips in the summer with all the windows rolled down. Any loose papers, coloring books or tissue boxes that weren't locked down on the floorboard risked being sucked out and deposited somewhere along the highway. 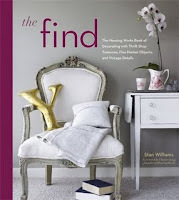 Get your very own copy of The Find: The Housing Works Book of Decorating with Thrift Shop Treasures, Flea Market Objects, and Vintage Details by visiting Amazon . If you already own The Find, email me your mailing address and I will send you a personalized plate that you can put in your copy. Just tell me what name or names you would like inside, if it's for a special occasion, or any other information you think I should know, and I'll dash you off one in the mail! For consulting, public speaking, personal appearances or media opportunites, The Elegant Thrifter is on call! Send your queries to theelegantthrifter@gmail.com. It's The Elegant Thrifter Calling! Thank you Guildery.com! - Thank you Guildery.com for featuring my fabric selections on your website! To view the full article CLICK HERE. Apartment Therapy named The Find best design book of 2009. Read it here. Wondering how to deal with a drunk at your holiday party or a good excuse for declining an invite? Los Angeles Times hit my funny bone when they asked me for some advice. Read it here. 1st Dibs wrote an amazing review of The Find. Read it here. Los Angeles Times went cocktail nuts for The Find and The Elegant Thrifter on May 23. My pal Ruth Handel and I threw a cocktail party back in February, and here are the results. Be sure to click in the box with the forks to read the sidebar! Vanessa DeVargas gave The Find a glowing review and interviewed me in Apartment Therapy, here. House Beautiful features editor, Aaron Krach said in his blog that after reading The Find, he was inspired to go thrift shopping! Read about it, here. How many folks have visited since November 2009?